Carla Shane from the blog Playful Learning Brooklyn recently contacted me with a great weather bear she made for her classroom. Carla has been teaching for six years, three of those with preschool special ed. She says she loves to make materials for her class by herself. 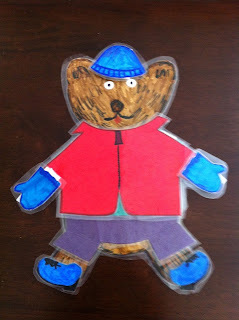 Carla's weather bear was recently highlighted on Classroom DIY! All the instructions to make this great weather bear are there. I think it is a great idea in that you can personalized what the bear can wear for the seasons, you can change the color of the outfits to fit the colors you may be doing, you can make something corresponding to letters or numbers you may be working on. By creating your own materials it makes it so much easier to incorporate your lessons with the everyday activities. Thanks so much Carla for the great idea and good luck to you. This is great! I'm going to try this with my students!